Inexpensive, strong, and utilitarian, the classic Mason Jar makes a great drinking mug except for one problem: the glass gets too hot to handle when you’re drinking coffee, tea or other steamy beverages. Crocheted cozies can remedy the heat-transfer problem, but Marsh Gooding had a different aesthetic in mind when he designed the Holdster. Made from thick, vegetable-tanned leather, the Holdster fits 16-ounce wide-mouth canning jars like a glove. 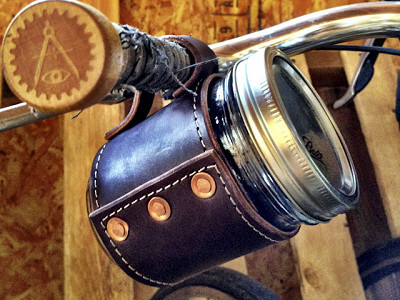 And, just like a vintage baseball glove, the Holdster will soften over time as you break it in and make it your own. Exquisite details, such as cross-stitched seams and copper rivets, highlight the leather, which has a classic, tailored look, smells wonderful, and feels comfortable as it protects your hands from hot contents. Marsh developed the Holdster in Burlington, Vermont, where the first prototypes were hand-cut and sewn. He teamed with Bobby Paulus, and they moved production from their backyard to a saddle shop in Mount Hope, Ohio. Marsh, who’s the great-grandson of a Colorado saddlery owner, wanted to create a product that feels like it was made 100 years ago, yet has the longevity to last 100 years from now. Mission accomplished. Some of life's best daily rituals revolve around drinks. For me, my mug of choice for my morning coffee is a Holdster. Leather and glass seem to be the perfect match for such a timeless ritual, so I hope that you enjoy checking out the Holdster Mason Jar mug. I'm very excited to have it featured here on Daily Grommet. I’m here to answer any questions you may have, so fire away. Yay! I've been loving my Cuppow lidded Mason Jars for coffee consumption...but they are a bit hot to handle. So thanks to Marsh, Grommet, and Ohio for solving the problem. Grommeteers...why not offer a Holder USA/Cuppow Bundle!? @Drew Beja Hi Drew. Great suggestion. Want to come and work part-time on our discovery team? :) Your friends here would like to see you again. @Matt Miller Hey Matt, For a quality leather good that is expertly finished with robust hardware and made in the US by a small company that has not yet scaled, I think we are actually looking at a very reasonable price. Alas, our US consumer perception of prices has been totally corrupted by our discount culture and the relentless drive to make things cheap rather than good. OK off my soap box now...but I had to share our expert point of view...we see 100 ideas a week and know the full value behind a product. At Grommet we never back companies and products that have a poor price and value relationship. Holdster withstood our scrutiny on the front beautifully. Actually, for handmade leathergoods the price is pretty good. You just have to be willing to pay that for a coffee mug. It's really beautiful though, and for something you use every day, I might go for it- great gift for my Montana cousins. @Matt Miller - Matt, I have not purchased this yet, but given that a double walled stainless steel coffee mug costs a _minimum _of $20 at Starbucks (generally closer to $30) and it is not made in the USA or from a small business, I think this is a darn good deal. You get a wide mouth jar, too, which itself is at least a dollar each at the store (though you would have to buy a pack of 8-12). I love drinking out of canning jars and think this is a wonderful idea! I also love the fact that if I'm rushed and haven't washed my mug, I can just grab a clean jar from the cupboard, slip the Holdster on and I'm ready to go - very cool! @Holdster - wishing you much success! My boyfriend is from Bethel, VT so I'm a bit particular about supporting businesses from your beautiful state. @ Anita D'Souza we could not have said it better ourselves! Thank you very much for the support and we are glad you like them! These look great! My question is I know leather will stretch after a period of time. What keeps the jar from slipping out of the holder? Is there a bottom sling or something? @ Jo Great question... there is actually a glass lip on the jar that the Holdster rests up against that will not allow the jar through past a certain point and that lip does not get in the way while trying to drink from the Holdster as well. What you receive here, is so much more than mason jars. You're getting hand crafted, hand sewn, made in the U.S.A leather holders that will last forever. Given this information, we're actually looking at a very reasonable price for these. As you'll see from our CEO, Jules Pieri, above, we never back companies and products that have a poor price and value relationship. We feel strongly about these as a worthy Grommet. I have to say that these are quite attractive and I really want to buy them both for myself and for gifting. The price, although I do feel it is worth it, is a bit steep for me. So, as I am trying to convince myself to 'go for it', here's my question - Do these come with the glass jar? I do not have any mason jars. Also, can they be microwaved? Or, can you remove the jar from the holder? Thanks. @ Cyn F The Holdsters do come with a mason jar. We do not recommend microwaving your Holdster but the Holdster is easily removed from the mason jar. 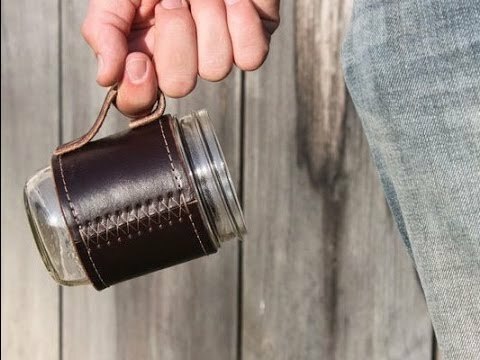 Inexpensive, strong, and utilitarian, the classic Mason Jar makes a great drinking mug except for one problem: the glass gets too hot to handle when you’re drinking coffee, tea or other steamy beverages. Crocheted cozies can remedy the heat-transfer problem, but Marsh Gooding had a different aesthetic in mind when he designed the Holdster. 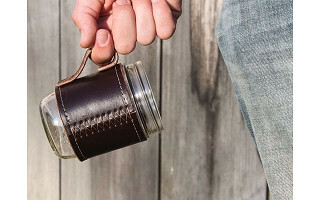 Made from thick, vegetable-tanned leather, the Holdster fits 16-ounce wide-mouth canning jars like a glove. And, just like a vintage baseball glove, the Holdster will soften over time as you break it in and make it your own. Exquisite details, such as cross-stitched seams and copper rivets, highlight the leather, which has a classic, tailored look, smells wonderful, and feels comfortable as it protects your hands from hot contents. Marsh developed the Holdster in Burlington, Vermont, where the first prototypes were hand-cut and sewn. He teamed with Bobby Paulus, and they moved production from their backyard to a saddle shop in Mount Hope, Ohio.